Did you know that today is national cat day? 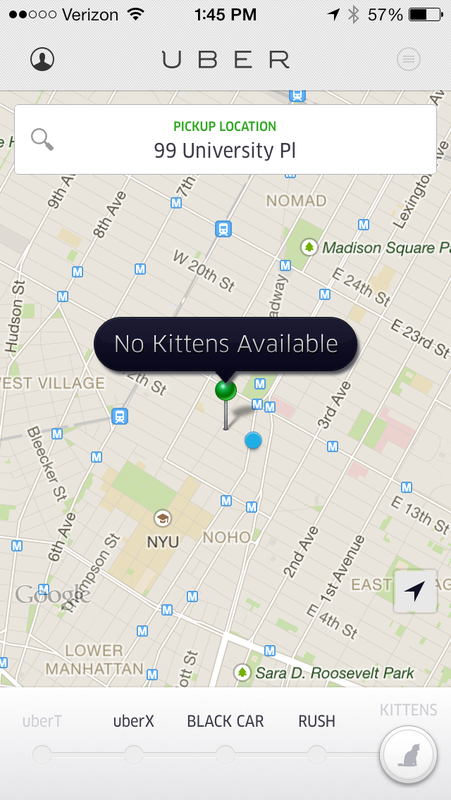 And did you know that for one day only, Uber (the car service app) is letting you request a kitten on-demand. That’s right – for a donation of $30 to the ASPCA, you can get a kitten delivered to your office for 15 minutes of snuggle time! As soon as I heard about this, I immediately logged into Uber to request my kitten. Sadly, this promotion seems to have spread like wildfire and there are no kittens available. There is nothing worse than the offer of kitten snuggles and then not being able to take advantage of it. Here are a few of my favorite cat videos as a consolation prize. Just a cat dressed as a shark riding a Roomba, while a baby, also dressed as a shark looks on.